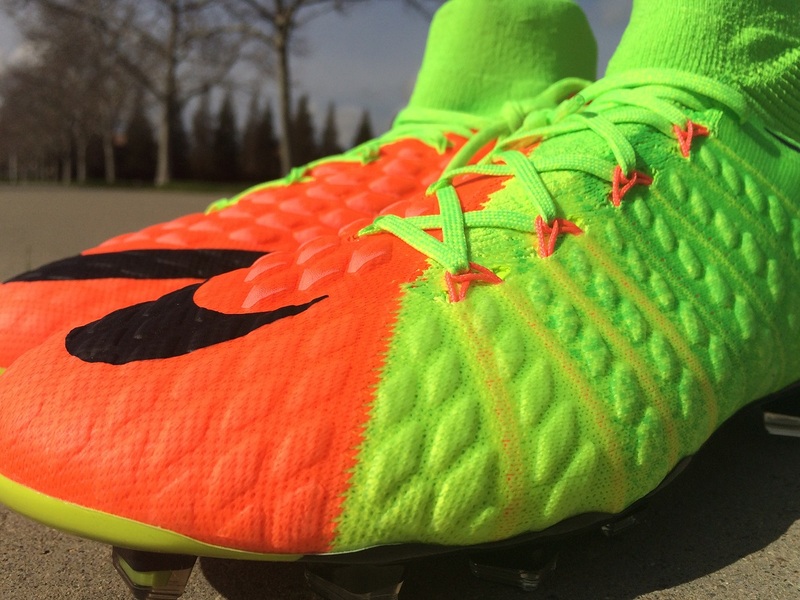 There is no doubt that Nike has established a very specific target market for their latest Hypervenom Phantom 3 release. No longer is the swoosh using the term “deadly agility” with the Hypervenom; now it is all about “lethal finishers”, each component designed for scoring goals. It is a radical move that takes the signature silo in a completely new direction. In order to take it to another level, every piece of the boot has been inspected and modified to suit an attack minded mold. From an off-cut dynamic fit collar, to a completely updated upper strike zone, there is a lot to break down on these. How do they actually perform on pitch and can they be worn by players in more positions than just strikers? Find out below! 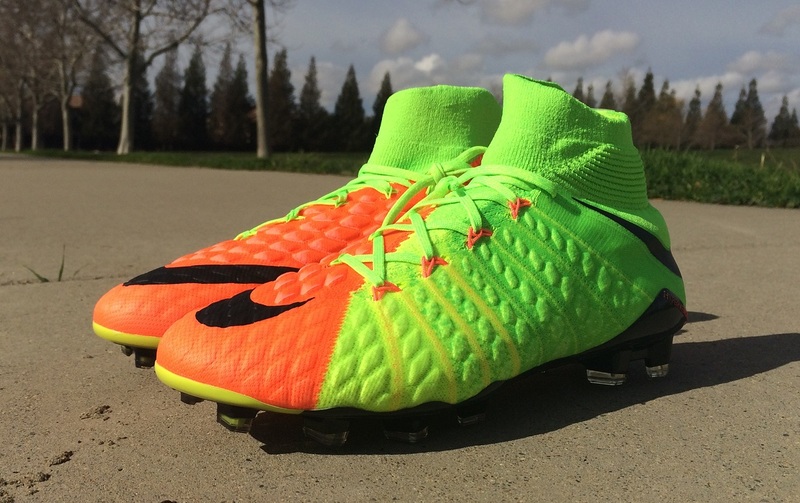 Check out all the latest Hypervenom 3 colorways at soccer.com. 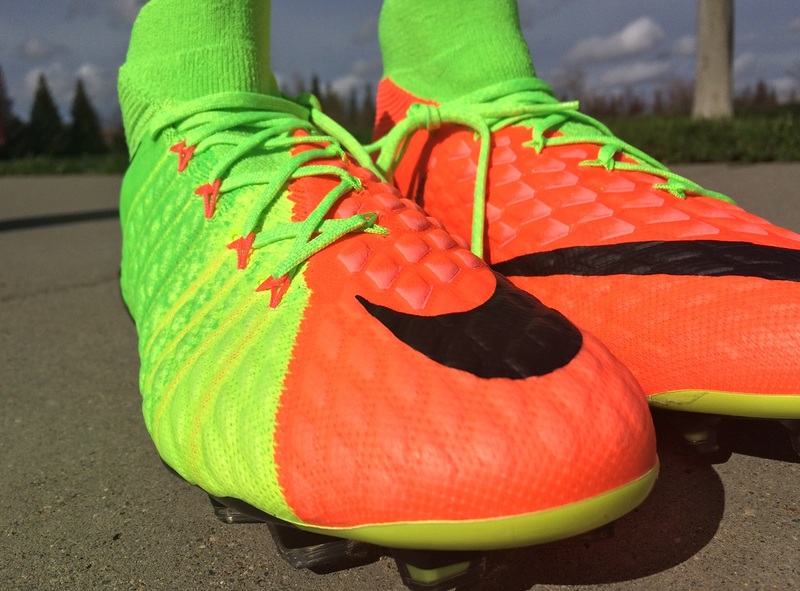 In typical Nike fashion, the intro release in the series features a wild colorway, designed to stand-out on pitch. And then there is the fact they are intended for a new type of player, something that definitely creates an extra air of intrigue. With so many new pieces, this is a boot with a lot to pieces to cover. After a few weeks of wearing these boots, I’m loving everything about the feel and fit. And, that all started right back at the beginning when I first took them out of the box. 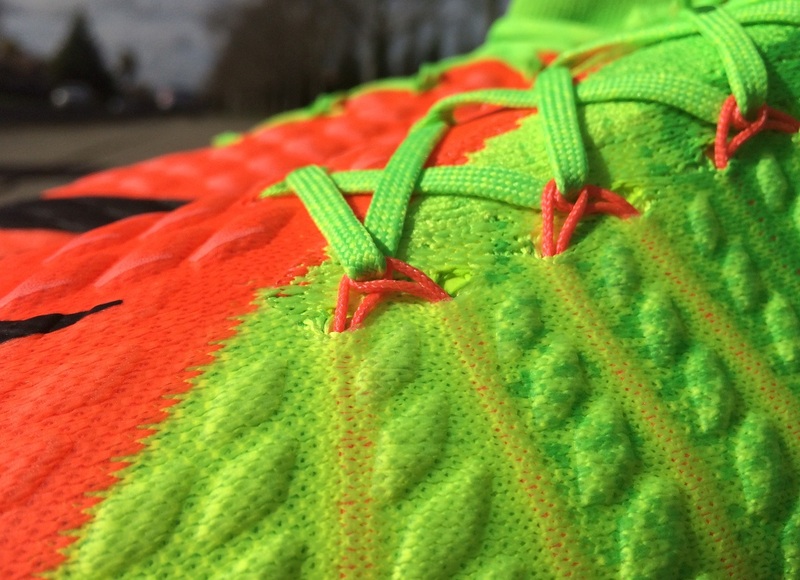 Because the upper of the boot is entirely made of Flyknit, you know it is going to be extremely pliable. You can easily mold and fold the material under your fingers. It is essentially broken in before you even get to touch them! They are easy to slip on and right through the forefoot, they are super soft. Then underfoot, there is a new soleplate and traction system. The actual soleplate is extremely flexible, so much so that you can easily bend it in both direction, similar to what you can do with the Puma evoPOWER series. That means the only thing you need to worry about is the actual stud configuration and whether it works with your playing style. Pending you have the right size, this is a very comfortable boot that shouldn’t cause many people any concern. I obviously recommend you try break them in during a training session first to really adjust to the fit, shape and overall performance. But, if it comes down to having to wear a new pair in a game right out of the box, these are a solid option. 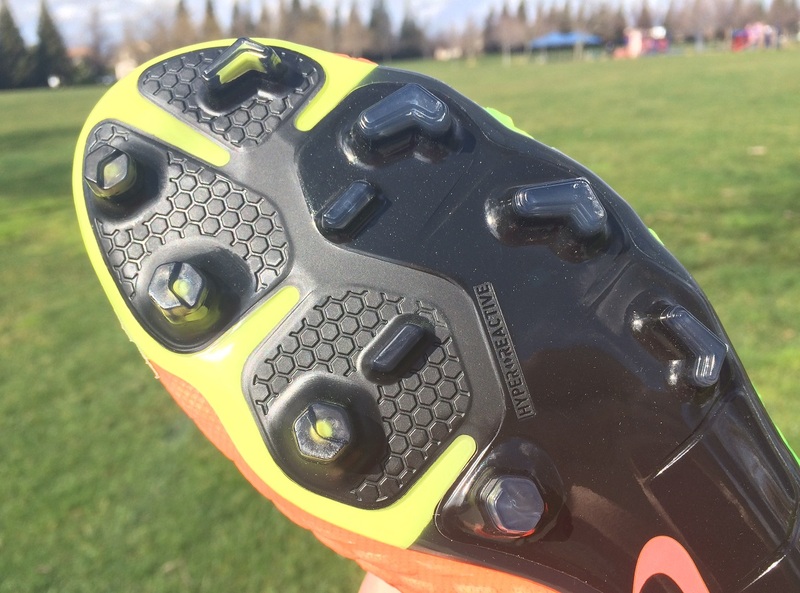 In case you didn’t already know, the DF naming convention on this boot stands for “Dynamic Fit”, the name Nike has given to their mid cut collar. Also, just to note that rather than the tiers going Phantom, Phinish, Phatal, this time around it goes Phantom DF, Phantom, Phatal. So, there is no Phinish anymore and DF now needs to be used in describing this particular silo. Ok, so the DF Collar, what has it going on? Over the past year or two, you might have become familiar with me stating I’m not a mid-cut collar guy, instead preferring a regular ankle cut. That was based on my experience with the initial mid-cut collar releases and the type of fit they provided. Things started changing with the release of the Magista II, and I have to say that they are again improved with this release. There are two things that help here. First, the angled cut actually does make for a better fit. 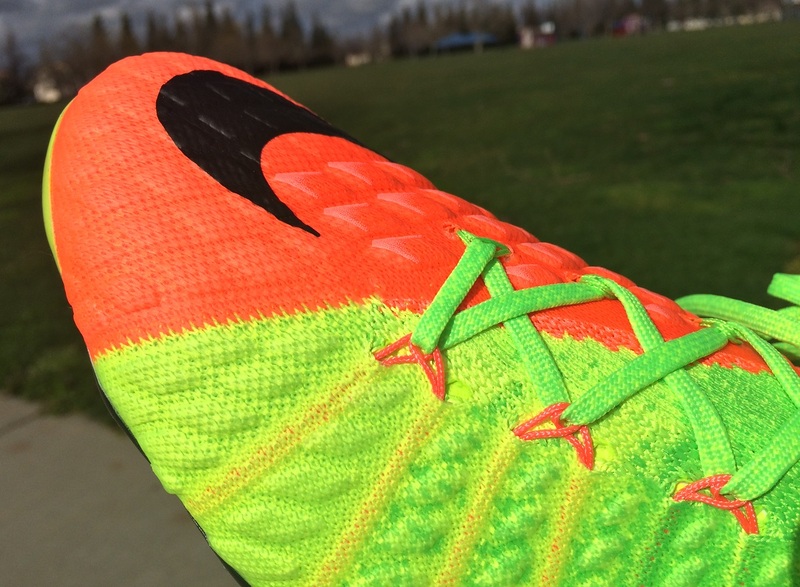 Nike has basically sliced the collar down from inside to outside of the boot at somewhere around a 45 degree angle. They have then tailored the material so it has more stretch along the ridged knit area, and it is tighter along the top lip region. This means that in play, they stay tighter toward the top, while allowing for additional stretch as your ankle pivots. In play, you definitely notice it. Does this mean it is a winner? I’ve got to admit that it is an improvement and each new release/modification seems to be taking the technology in the right direction. I enjoyed the feel and didn’t necessarily want out of the boots because of the cut. There was also no pressure on the Achilles, something I had noticed with previous models. 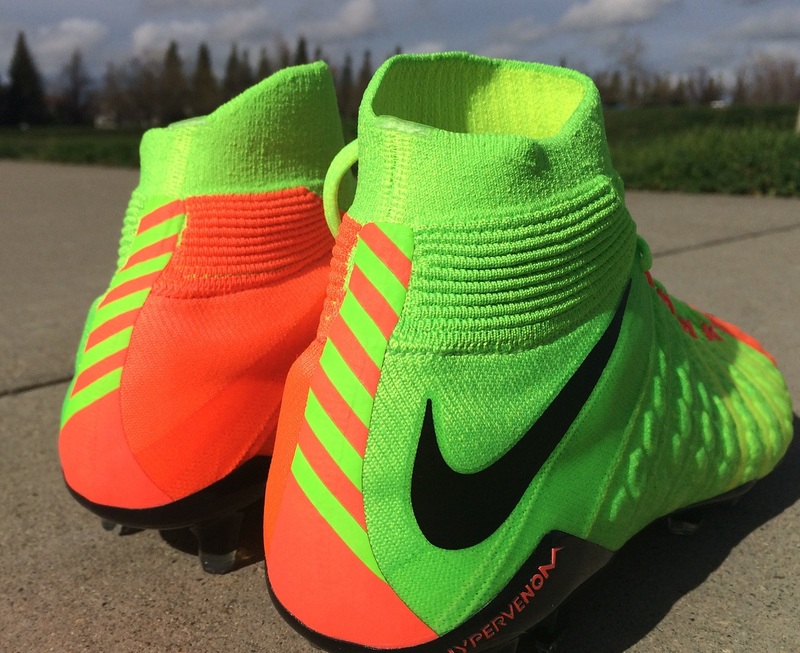 BUT, I’d still choose the Magista collar over this one, and a regular ankle cut over that. In other words, I’m impressed, but not enough to want to make them my new go to boot. Lets talk about the upper for a second and the fact that Nike are using a complete Flyknit upper on the Hypervenom for the first time. This is such a positive move and one of the elements that makes it such a more dynamic boot. The entire upper has a very pliable feel to it thanks to the knot structure, with ACC (All Conditions Control) placed on top to help give structure to the material. You need the ACC to keep the material shape, ensuring it has a more durable lifespan. Without it, the upper would be way to flimsy and there is a chance that the knit would overstretch. Right through wear, they kept their shape nicely and I haven’t noticed too much in the way of over wear. Looking at the laces, you will notice that they actually run through thin wires rather than actually cutting into the upper of the boot. In similar fashion to previous models, the Flywire runs through channels in the upper right down around the sole. What is different on the Hypervenom 3 is the fact that you actually get to dictate how you tighten the boots thanks to how the laces pull the Flywire in tight around your foot. We have seen this sort of design on other boots, for example the Puma King EF. The wires actually ended up snapping on those boots, so lets hope the same is not true here. The only difference is the fact these run though two wires and Flywire is pretty darn strong! If any aspect of this boot makes it a strikers boot, it us the all important strike zone. Without actually employing it, the modifications to the upper has elevated this release into the power category, a category we haven’t seen Nike in since the retirement of the T90 Laser series. What they have done is lined the strike zone with PORON foam pods, which harden on impact to create a firmer and more responsive shot. I’ve got to say, they work an absolute treat. Nike has been strategic with the placement of the PORON foam pods, keeping them out of areas where you are taking lighter touches on the ball. As a result, you do get a very natural feel as you move with the ball at your feet, or take control of a short pass. But when you strike shots, the PORON foam pods act beautifully and reduce the amount of impact you feel while adding a little extra rebound. I felt very comfortable putting my foot right through shots, with the end result being some solidly hit shots. You feel confident knowing that if you connect properly, it will end up producing a pure power shot. There are also hollow pods that line different areas of the upper, including through the instep. In general, I thoroughly enjoy some added cushioning on the instep that allows you to get quick control on firm passes, pushing the ball out ever so slightly so it doesn’t get stuck under your foot. I continually revert back to the CTR360 Maestri line-up as a perfect example. Here, the material is hollow so it reduces the amount of rebound and helps in keeping a tight level of control in tight areas. Underfoot, you will find a soleplate that features a mix of hybrid conical studs and chevron blades, the same ones found on the current Superfly. The idea here is to allow for quick penetration along the inner side of the foot, while acceleration with the blades on the outer side. Basically, you are getting a wild selection of studs and blades that have been heavily researched and placed in a pattern that suits players in need of dynamic movement in tight spaces and acceleration going forward. The technical name is “Hyperactive soleplate”. How does it work? Well, it is one of those things that I didn’t notice too much in play. That is primarily a good thing! Not having to worry about feel underfoot is always a positive, allowing you to focus on the important things in-game. On both FG and AG surfaces, where I tested the boots, there was never a moment when I felt like I lost my footing or didn’t have control of my movements. 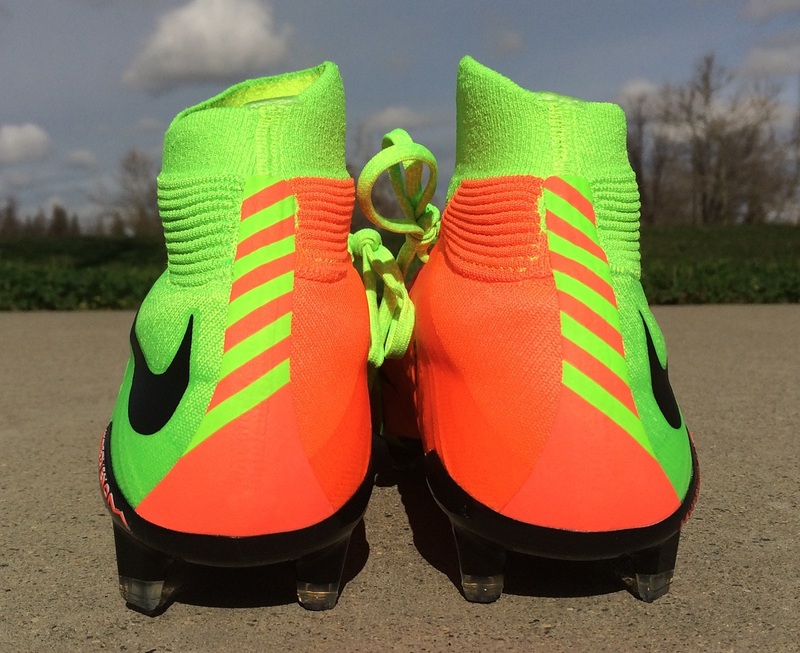 One other thing to note here is that Nike has modified the material in the soleplate, making it much more pliable. As a result, you can actually bend the plate in both directions (if you so choose). This is something Puma advertise with the evoPOWER series, as a performance aspect that allows for a more natural foot movement as you strike the ball, adding extra force behind your shot. 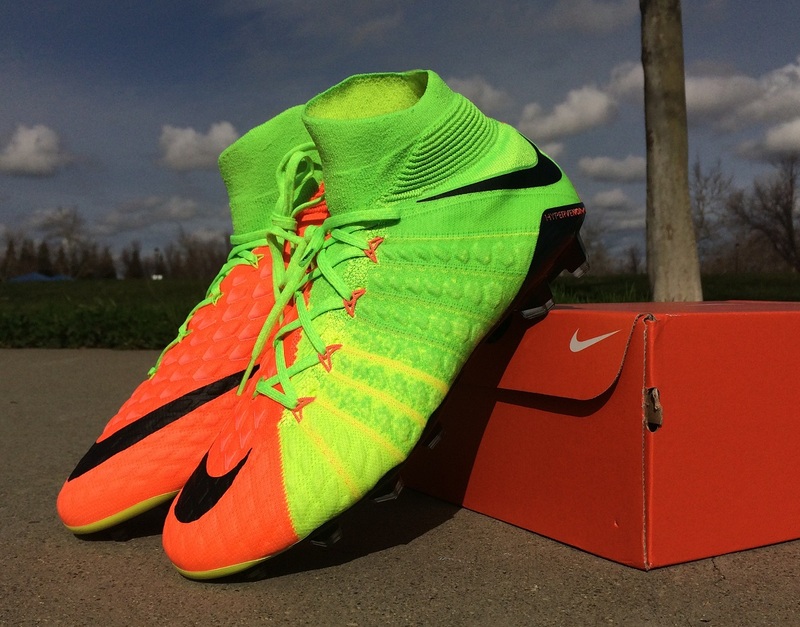 Nike hasn’t pointed that out much with the Hypervenom, but if it works for the evoPOWER, it must also work here, right? As I said above, I loved using these as a power boot so I’d agree that it plays a positive role in the boots performance! There isn’t a whole lot of difference in size between these and other Nike dynamic fit boots, with the boot built on the same shape solebed. It all comes down to the upper and how pliable it is. Here, the material has some give and even with the Flywire in place, it does loosen some through wear. In general, I’d rate them as having a medium/wide fit starting out, with the ability to suit a standard wide fit. In terms of length, they are true to size and very much in line with other Nike releases. This is a fun release that won’t really disappoint in too many departments. So, there is note a whole lot of negatives to point out. If there is anything it is something I note with DF boots, that the knit material is likely to pick up plenty of dirt and since it is snug to your foot, a pungent smell. I’ve tried several things to stop all of my DF boots from smelling, but they all end up the same way. But to date, that is all I have to add here! Listen, like any Nike release, they needed to find a target market for this release. That is the starting point for any boot, and as a result it becomes the focal point once the boots goes to market. Just look at the line-up of key players wearing them; Marcus Rashford, Harry Kane, Gonzalo Higuain, Edinson Cavani, and without a doubt the lead player for the range Robert Lewandowski. All are strikers, thus the need to push these as a “lethal finishers” boot. In saying that, they have a wide appeal to many playing types and styles. The added power element provides an ideal area for defenders to play long balls out of the boot while adding some protection through heavy tackles. They are ideal as a strikers boot, but just because you play another position it doesn’t mean they won’t suit your style. If you are looking to pick up a pair, find them available at soccer.com. Highlight: The first Hypervenom to feature a full Flyknit upper, designed with power shots and strikers specifically in mind. Would I Buy Them: A very enjoyable boot to wear that provides excellent ping on shots. Yes, I’d invest in a pair. Player Position: Advertised for strikers, but as per above they are a very versatile boot that can be worn by many player types. Love your reviews by the way. When shopping for new cleats I always look up your reviews on them before I buy. Would love your thoughts on how these compare to the Magista Obra 2s as many of your conclusions are similar in both reviews. The differences may in fact be marginal but would be helpful to now what they are. Thanks for all the good work. i love the boots but the sock takes ages to put on around my heel, any tips?